(CNN)A smuggler "deliberately drowned" up to 50 Somali and Ethiopian migrants in the sea off Yemen's coast, the United Nations migration agency said. 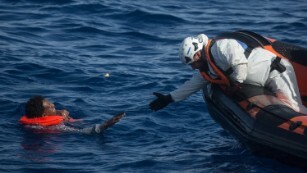 The teenage migrants were trying to reach the Gulf countries via Yemen on Wednesday. In a statement, the International Organization for Migration described the drownings in the Arabian Sea as "shocking and inhumane." "The survivors told our colleagues on the beach that the smuggler pushed them to the sea when he saw some 'authority types' near the coast," said Laurent de Boeck, the Yemen mission chief for the International Organization for Migration. "They also told us that the smuggler already has returned to Somalia to continue his business and pick up more migrants to bring to Yemen on the same route." Shortly after the drowning, IOM staff found shallow graves of 29 migrants on a beach in Shabwa, the UN agency said. "The dead had been quickly buried by those who survived the smuggler's deadly actions."